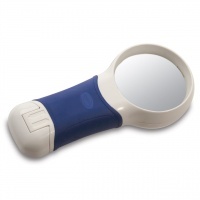 Check out our selection of easy-grip magnifiers for people with low vision and hand dexterity issues. 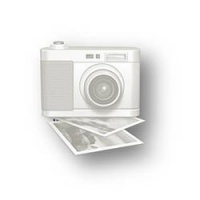 The Coil AT-Max Auto Touch 3x, 9-diopter LED Illuminated Magnifier with its 3.27 x 2.32 (83mm x 59mm) rectangular bi-aspheric lens offers a large, low-distortion field of view and uniform LED light across the lens, for an easier reading experience. Its ergonomic handle conforms to the natural shape of the hand, making it comfortable to use for longer periods and easier for the arthritic and those with limited dexterity to hold. 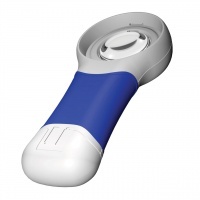 The Coil AT-Max is extra lightweight and features an auto touch on/off switch for smooth and simple operation. Batteries are easy to access and change. Uses 2 AA batteries (not included.) Included soft cloth pouch protects magnifier while not in use. Color: Blue/White. The Coil AT-Max Auto Touch 5x, 16-diopter LED Illuminated Magnifier with its 2.36 (60mm) diameter round aspheric lens offers a large, low-distortion field of view and uniform LED light across the lens, for an easier reading experience. Its ergonomic handle conforms to the natural shape of the hand, making it comfortable to use for longer periods and easier for the arthritic and those with limited dexterity to hold. Coil AT-Max Auto Touch 7x LED Illuminated Magnifier- Round - The Coil AT-Max Auto Touch 7x, 24-diopter LED Illuminated Magnifier with its 2.27 (57.6mm) diameter round aspheric lens offers a large, low-distortion field of view and uniform LED light across the lens for an easier reading experience for those with low vision. Its ergonomic handle conforms to the natural shape of the hand, making it comfortable to use for longer periods and easier for the arthritic and those with limited dexterity to hold. 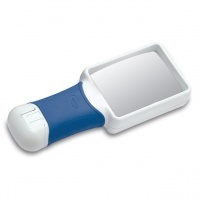 The Coil AT-Max visual aid magnifier is extra lightweight and features an auto touch on/off switch for smooth and simple operation. Batteries are easy to access and change. Uses 2 AA batteries (not included.) Included soft cloth pouch protects magnifier while not in use. Color: Blue/White. 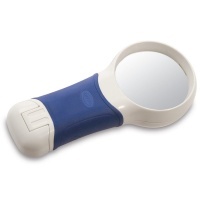 Coil AT Max Auto Touch 9x 32D 42mm LED Illuminated Magnifier is great for spot reading tasks such as viewing utility bills, product labels, price tags and other small print. 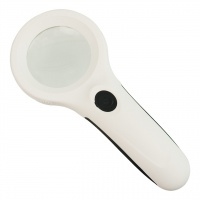 This exclusive line of COIL UK LED Illuminated Handheld Magnifiers is custom-manufactured in the United Kingdom to the highest precision standards using the finest quality materials.